As one of the founding organisations of the Labour Representation Committee in 1900, and as an important influence upon the Labour Party which grew from it, the Fabian Society has had a powerful influence on British politics. Other members of the Fabian Society have included political leaders from countries formerly part of the British Empire, such as Jawaharlal Nehru, who adopted Fabian principles as part of their own political ideologies. The Fabian Society founded the London School of Economics and Political Science in 1895. Today, the society functions primarily as a think tank and is one of 21 socialist societies affiliated with the Labour Party. Similar societies exist in Australia (the Australian Fabian Society), in Canada (the Douglas–Coldwell Foundation and the now disbanded League for Social Reconstruction), in Sicily (Sicilian Fabian Society) and in New Zealand (The NZ Fabian Society). The Fabian Society was named — at the suggestion of Frank Podmore — in honour of the Roman general Quintus Fabius Maximus Verrucosus (nicknamed "Cunctator", meaning the "Delayer"). His Fabian strategy sought gradual victory against the superior Carthaginian army under the renowned general Hannibal through persistence, harassment, and wearing the enemy down by attrition rather than pitched, climactic battles. According to author Jon Perdue, "The logo of the Fabian Society, a tortoise, represented the group’s predilection for a slow, imperceptible transition to socialism, while its coat of arms, a 'wolf in sheep’s clothing', represented its preferred methodology for achieving its goal." The wolf in sheep's clothing symbolism was later abandoned, due to its obvious negative connotations. Many Fabians participated in the formation of the Labour Representation Committee in 1900 and the group's constitution, written by Sidney Webb, borrowed heavily from the founding documents of the Fabian Society. At the meeting that founded the Labour Representation Committee in 1900, the Fabian Society claimed 861 members and sent one delegate. The years 1903 to 1908 saw a growth in popular interest in the socialist idea in Great Britain and the Fabian Society grew accordingly, tripling its membership to nearly 2500 by the end of the period, half of whom were located in London. In 1912, a student section was organised called the University Socialist Federation (USF) and by the outbreak of World War I this contingent counted its own membership of more than 500. The first Fabian Society pamphlets advocating tenets of social justice coincided with the zeitgeist of Liberal reforms during the early 1900s, including eugenics. The Fabian proposals however were considerably more progressive than those that were enacted in the Liberal reform legislation. The Fabians lobbied for the introduction of a minimum wage in 1906, for the creation of a universal health care system in 1911 and for the abolition of hereditary peerages in 1917. Fabian socialists were in favour of reforming Britain's imperialist foreign policy as a conduit for internationalist reform, and were in favour of a capitalist welfare state modelled on the Bismarckian German model; they criticised Gladstonian liberalism both for its individualism at home and its internationalism abroad. They favoured a national minimum wage in order to stop British industries compensating for their inefficiency by lowering wages instead of investing in capital equipment; slum clearances and a health service in order for "the breeding of even a moderately Imperial race" which would be more productive and better militarily than the "stunted, anaemic, demoralised denizens ... of our great cities"; and a national education system because "it is in the classrooms ... that the future battles of the Empire for commercial prosperity are already being lost". In 1900 the Society produced Fabianism and the Empire, the first statement of its views on foreign affairs, drafted by Bernard Shaw and incorporating the suggestions of 150 Fabian members. It was directed against the liberal individualism of those such as John Morley and Sir William Harcourt. It claimed that the classical liberal political economy was outdated, and that imperialism was the new stage of the international polity. The question was whether Britain would be the centre of a world empire or whether it would lose its colonies and end up as just two islands in the North Atlantic. It expressed support for Britain in the Boer War because small nations, such as the Boers, were anachronisms in the age of empires. In order to hold onto the Empire, the British needed to fully exploit the trade opportunities secured by war; maintain the British armed forces in a high state of readiness to defend the Empire; the creation of a citizen army to replace the professional army; the Factory Acts would be amended to extend to 21 the age for half-time employment, so that the thirty hours gained would be used in "a combination of physical exercises, technical education, education in civil citizenship ... and field training in the use of modern weapons". The Fabians also favoured the nationalisation of land rent, believing that rents collected by landowners in respect of their land's value were unearned, an idea which drew heavily from the work of American economist Henry George. In the period between the two World Wars, the "Second Generation" Fabians, including the writers R. H. Tawney, G. D. H. Cole and Harold Laski, continued to be a major influence on socialist thought. It was at this time that many of the future leaders of the Third World were exposed to Fabian thought, most notably India's Jawaharlal Nehru, who subsequently framed economic policy for India on Fabian socialism lines. After independence from Britain, Nehru's Fabian ideas committed India to an economy in which the state owned, operated and controlled means of production, in particular key heavy industrial sectors such as steel, telecommunications, transportation, electricity generation, mining and real estate development. Private activity, property rights and entrepreneurship were discouraged or regulated through permits, nationalisation of economic activity and high taxes were encouraged, rationing, control of individual choices and Mahalanobis model considered by Nehru as a means to implement the Fabian Society version of socialism. In addition to Nehru, several pre-independence leaders in colonial India such as Annie Besant—Nehru's mentor and later a president of Indian National Congress – were members of the Fabian Society. In the Middle East, the theories of Fabian Society intellectual movement of early-20th-century Britain inspired the Ba'athist vision. The Middle East adaptation of Fabian socialism led the state to control big industry, transport, banks, internal and external trade. The state would direct the course of economic development, with the ultimate aim to provide a guaranteed minimum standard of living for all. Michel Aflaq, widely considered as the founder of the Ba'athist movement, was a Fabian socialist. Aflaq's ideas, with those of Salah al-Din al-Bitar and Zaki al-Arsuzi, came to fruition in the Arab world in the form of dictatorial regimes in Iraq and Syria. Salāmah Mūsā of Egypt, another prominent champion of Arab Socialism, was a keen adherent of Fabian Society, and a member since 1909. Fabian academics of the late 20th-century included the political scientist Bernard Crick, the economists Thomas Balogh and Nicholas Kaldor and the sociologist Peter Townsend. Through the course of the 20th century, the group has always been influential in Labour Party circles, with members including Ramsay MacDonald, Clement Attlee, Anthony Crosland, Roy Jenkins, Hugh Dalton, Richard Crossman, Ian Mikardo, Tony Benn, Harold Wilson and more recently Shirley Williams, Tony Blair, Gordon Brown, Gordon Marsden and Ed Balls. 229 Society members were elected to Parliament in the 1945 General Election. Ben Pimlott served as its chairman in the 1990s. (A Pimlott Prize for Political Writing was organised in his memory by the Fabian Society and The Guardian in 2005 and continues annually.) The Society is affiliated to the Party as a socialist society. In recent years the Young Fabian group, founded in 1960, has become an important networking and discussion organisation for younger (under 31) Labour Party activists and played a role in the 1994 election of Tony Blair as Labour Leader. Today there is also an active Fabian Women's Network and Scottish and Welsh Fabian groups. On 21 April 2009 the Society's website stated that it had 6,286 members: "Fabian national membership now stands at a 35 year high: it is over 20% higher than when the Labour Party came to office in May 1997. It is now double what it was when Clement Attlee left office in 1951". The latest edition of the Dictionary of National Biography (a reference work listing details of famous or significant Britons throughout history) includes 174 Fabians. Four Fabians, Beatrice and Sidney Webb, Graham Wallas, and George Bernard Shaw, founded the London School of Economics with the money left to the Fabian Society by Henry Hutchinson. Supposedly the decision was made at a breakfast party on 4 August 1894. The founders are depicted in the Fabian Window designed by George Bernard Shaw. The window was stolen in 1978 and reappeared at Sotheby's in 2005. It was restored to display in the Shaw Library at the London School of Economics in 2006 at a ceremony over which Tony Blair presided. As of 2016, the Fabian Society had about 7,000 members. With the advent of a Labour Party government in 1997, the Fabian Society was a forum for New Labour ideas and for critical approaches from across the party. The most significant Fabian contribution to Labour's policy agenda in government was Ed Balls's 1992 pamphlet, advocating Bank of England independence. Balls had been a Financial Times journalist when he wrote this Fabian pamphlet, before going to work for Gordon Brown. BBC Business Editor Robert Peston, in his book Brown's Britain, calls this an "essential tract" and concludes that Balls "deserves as much credit – probably more – than anyone else for the creation of the modern Bank of England"; William Keegan offered a similar analysis of Balls's Fabian pamphlet in his book on Labour's economic policy, which traces in detail the path leading up to this dramatic policy change after Labour's first week in office. In early 2017 Fabian general secretary, Andrew Harrop, produced a report arguing the only feasible route for Labour to return to government would be to work with the Liberal Democrats and Scottish National Party. Based on then-current polling, it predicted Labour would win fewer than 200 seats in the next general election, the lowest since 1935, due to Brexit, lack of support in Scotland, and Labour leader Jeremy Corbyn’s purported unpopularity. This prediction was proven false in the general election later in 2017 in which Labour won 262 seats. The major influence on the Labour Party and on the English-speaking socialist movement worldwide, has meant that Fabianism became one of the main inspirations of international social democracy. An American Fabian Society was established in Boston in February 1895 by W. D. P. Bliss, a prominent Christian socialist. The group published a periodical, The American Fabian, and issued a small series of pamphlets. Around the same time a parallel organization emerged on the Pacific coast, centred in California, under the influence of socialist activist Laurence Gronlund. Direct or indirect Fabian influence may also be seen in the liberal socialism of Carlo Rosselli (founder, with his brother Nello Rosselli, of the anti-fascist group's Giustizia e Libertà) and all its derivatives such as the Action Party in Italy. The Community Movement, created by the socialist entrepreneur Adriano Olivetti, was then the only Italian party which referred explicitly to Fabianism, among his main inspirations along with federalism, social liberalism, fighting partitocracy and social democracy. It is written into the rules of the society that it has no policies. All the publications carry a disclaimer saying that they do not represent the collective views of the society but only the views of the authors. "No resolution of a political character expressing an opinion or calling for action, other than in relation to the running of the Society itself, shall be put forward in the name of the Society." The Fabian Society is governed by an elected executive committee. The committee consists of 10 ordinary members elected from a national list, three members nationally elected from a list nominated by local groups, representatives from the Young Fabians, Fabians Women's Network and Scottish and Welsh Fabians. There is also one staff representative and a directly elected honorary treasurer from the membership. Elections are held every other year, with the exception of the Young Fabians and staff representation which are elected annually. The committee meet quarterly and elect a chair and at least one vice-chair annually to conduct its business. The current chair of the Fabian Society is Kate Green. 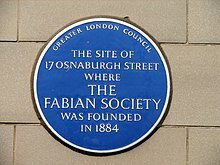 The Fabian Society have a number of employees based in their headquarters in London. The secretariat is led by a general secretary, who is the organisation's CEO. The staff are arranged into departments including Research, Editorial, Events and Operations. There are 45 local Fabian societies across the UK, bringing Fabian debates to communities around the country. Many of these are affiliated to their local constituency Labour party and have their own executive bodies. These local branches are affiliated to the national Fabians and local members have same voting rights as their national counterparts. In the early 1900s Fabian Society members advocated the ideal of a scientifically planned society and supported eugenics by way of sterilisation. In an article published in The Guardian on 14 February 2008 (following the apology offered by Australian Prime Minister Kevin Rudd to the "stolen generations"), Geoffrey Robertson criticised Fabian socialists for providing the intellectual justification for the eugenics policy that led to the stolen generations scandal. Similar claims have been repeated in The Spectator. However, these views on eugenics were not limited to one group of people and were widely shared throughout the political spectrum. Although H. G. Wells was a member of the Fabian Society from 1903 to 1908, he was a critic of its operations, particularly in his 1905 paper "The Faults of the Fabian" and parodied the society in his 1910 novel The New Machiavelli. At a speech in the United States the then British MP George Galloway denounced the Fabian Society for its failure to support the Irish uprising of Easter 1916 in Ireland in Dublin where an Irish Republic had been proclaimed. ^ George Thomson (1 March 1976). "The Tindemans Report and the European Future" (PDF). ^ Margaret Cole (1961). The Story of Fabian Socialism. Stanford University Press. ISBN 978-0804700917. ^ "The NZ Fabian Society". www.fabians.org.nz. ^ Edward R. Pease, A History of the Fabian Society. New York: E.P. Dutton & Co., 1916. ^ "The History of Essex Hall by Mortimer Rowe, Lindsey Press, 1959, chapter 5". Unitarian.org.uk. Archived from the original on 16 January 2012. Retrieved 2 January 2012. ^ "Fabian Society". Encyclopedia Britannica. Retrieved 24 August 2017. ^ Quoted in A.M. McBriar, Fabian Socialism and English Politics, 1884–1918. Cambridge: Cambridge University Press, 1966; pg. 9. ^ Perdue, Jon B. (2012). The War of All the People: The Nexus of Latin American Radicalism and Middle Eastern Terrorism (1st ed.). Washington, D.C.: Potomac Books. p. 97. ISBN 978-1597977043. ^ a b McBriar, Alan M. (1962). Fabian Socialism and English Politics, 1884-1918. Cambridge University Press. ^ a b c Cole, Margaret (1961). The Story of Fabian Socialism. Stanford University Press. ISBN 978-1163700105. ^ Pease, Edward R. (1916). The History of the Fabian Society. ^ Matthews, Race (1993). Australia's First Fabians: Middle-class Radicals, Labour Activists and the Early Labour Movement. Cambridge University Press. ^ a b Kevin Morgan, Labour Legends and Russian Gold: Bolshevism and the British Left, Part 1. London: Lawrence and Wishart, 2006; p. 63. ^ Bernard Semmel, Imperialism and Social Reform: English Social-Imperial Thought 1895–1914 (New York: Anchor, 1968), p. 63. ^ a b Semmel, p. 61. ^ Annie Besant. "The Future Socialism". Bibby's Annual (reprinted by Adyar Pamphlet). OCLC 038686071. ^ Padma Desai and Jagdish Bhagwati (April 1975). "Socialism and Indian economic policy". World Development. 3 (4): 213–21. doi:10.1016/0305-750X(75)90063-7. ^ B.K. Nehru (Spring 1990). "Socialism at crossroads". India International Centre Quarterly. 17 (1): 1–12. JSTOR 23002177. ^ Virmani, Arvind (October 2005). "Policy Regimes, Growth and Poverty in India: Lessons of Government Failure and Entrepreneurial Success" (PDF). Working Paper No. 170. Indian Council for Research on International Economic Relations, New Delhi. ^ Dunham, William Huse (1975). "From Radicalism to Socialism: Men and Ideas in the Formation of Fabian Socialist Doctrines, 1881–1889". History: Reviews of New Books. 3 (10): 263. doi:10.1080/03612759.1975.9945148. ^ a b Michael Barr (March 2000). "Lee Kuan Yew's Fabian Phase". Australian Journal of Politics & History. 46 (1): 110–26. doi:10.1111/1467-8497.00088. ^ Amatzia Baram (Spring 2003). "Broken Promises". Wilson Quarterly. Woodrow Wilson International Center for Scholars. ^ L. M. Kenny (Winter 1963–1964). "The Goal of Arab Unification". International Journal. 19 (1): 50–61. doi:10.2307/40198692. JSTOR 40198692. ^ Kamel S. Abu Jaber (Spring 1966). "Salāmah Mūsā: Precursor of Arab Socialism". Middle East Journal. 20 (2): 196–206. JSTOR 4323988. ^ "Our History". Fabians. Retrieved 17 June 2018. ^ Annual Report 2016 (PDF) (Report). Fabian Society. 2016. Retrieved 7 July 2017. ^ "The Fabian Society: a brief history". The Guardian. 13 August 2001. ISSN 0261-3077. Retrieved 24 August 2017. ^ Mark Wickham-Jones (2005). "Party Officials, Experts and Policy-making: The Case of British Labour" (PDF). r/ French Political Science Association. ^ Sunder Katwala (14 September 2003). "Observer review: The Prudence of Mr Gordon Brown by William Keegan | By genre | guardian.co.uk Books". London: Politics.guardian.co.uk. Retrieved 2 January 2012. ^ Andrew Rawnsley, columnist of the year (22 December 2001). "Honesty turns out to be the best policy". The Observer. London. Retrieved 2 January 2012. ^ "Think tank calls for NHS tax". BBC News. 27 November 2000. Retrieved 2 January 2012. ^ "In defence of earmarked taxes – FT 07/12/00". Samuelbrittan.co.uk. 15 December 1994. Archived from the original on 12 January 2012. Retrieved 2 January 2012. ^ Harrop, Andrew (3 January 2017). Stuck - How Labour is too weak to win and too strong to die (PDF) (Report). Fabian Society. Retrieved 26 June 2017. ^ Walker, Peter (2 January 2017). "Labour could slump to below 150 MPs, Fabian Society warns". The Guardian. Retrieved 26 June 2017. ^ MacLellan, Kylie (3 January 2017). "UK's opposition Labour 'too weak' to win an election: think tank". Reuters. Retrieved 26 June 2017. ^ a b c William D.P. Bliss (ed. ), The Encyclopedia of Social Reforms. Third Edition. New York: Funk and Wagnalls Co., 1897; pg. 578. ^ "Olivetti: comunitarismo e sovranità industriale nell'Italia postbellica". millennivm.org. ^ "Società Fabiana Siciliana - Associazione dei Socialisti Riformisti della Sicilia - Sedi regionali a Messina e Palermo". www.fabiana.it. ^ "Rules of the Fabian Society November 2017" (PDF). Fabian Society. Retrieved 17 June 2018. ^ Freedland, Jonathan (17 February 2012). "Eugenics: the skeleton that rattles loudest in the left's closet". The Guardian. ^ Geoffrey Robertson (13 February 2008). "We should say sorry, too". The Guardian. London. ^ L.J. Ray (1983). "Eugenics, Mental Deficiency and Fabian Socialism between the Wars". Oxford Review of Education. 9 (3): 213–22. doi:10.1080/0305498830090305. ^ "How eugenics poisoned the welfare state | The Spectator". The Spectator. 25 November 2009. Retrieved 26 December 2016. ^ Diane Paul (October – December 1984). "Eugenics and the Left". Journal of the History of Ideas. 45 (4): 567–590. doi:10.2307/2709374. JSTOR 2709374. ^ Christopher Badcock (2008). "Eugenics" (PDF). London School of Economics and Political Science. ^ Taunton, Matthew. "H G Wells's politics". The British Library. Retrieved 5 October 2016. ^ pas1888 (29 December 2009). "George Galloway Easter Rising 1916" – via YouTube. Howell, David (1983). British Workers and the Independent Labour Party, 1888–1906. Manchester: Manchester University Press. McBriar, A.M. (1962). Fabian Socialism and English Politics, 1884–1918. Cambridge: Cambridge University Press. Pease, Edward R. (1916). A History of the Fabian Society. New York: E.P. Dutton & Co.
Radice, Lisanne (1984). Beatrice and Sidney Webb: Fabian Socialists. London: Macmillan. Shaw, George Bernard, ed. (1931). Fabian Essays in Socialism. London: Fabian Society. Shaw, George Bernard, ed. (1906) . The Fabian Society: Its Early History. London: Fabian Society. Wolfe, Willard (1975). From Radicalism to Socialism: Men and Ideas in the Formation of Fabian Socialist Doctrines, 1881–1889. New Haven, CT: Yale University Press.